Pocketing first pass was adjusted. Profile single pass is now active. Many other adjustments were made to clear all reported issues in the new functionality. Select a tool has had slight changes to the functionality. When you select a new tool the offsets will always be the same as the tool number. They will only change if edited manually by the user and then they will get saved for that operation. 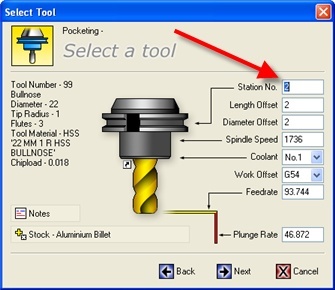 If you select a new tool the offsets will then be again the same as the tool and would need to be edited again if a user requires different offsets. This means if you don't edit your offsets they will always be the same as your tool number.